John BROWNE Sr. (Swansea) (1583 – 1662) was Alex’s 11th Great Grandfather, one of 4,096 in this generation of the Shaw line. John was a friend and associate of the leaders of Plymouth Colony and it is said in his honor that he was the first magistrate to raise his voice against the coercive support of the ministry, taking the stand that all church support should be voluntary. John Browne was born on 29 June 1600 in Swan Hall, Hawkedon, Suffolk, England. His parents were William BROWNE and Margaret GOODRICH. John clearly moved in important circles in England For example, in 1655 he stayed with the Wray family at Belleau, the Lincolnshire home of Sir Harry Vane son of Sir Henry Vane the Elder) not far from Boston, where Roger Williams had also stayed. While Mr. Browne was at Belleau in 1657 George Fox [Founder of the Society of Friends] came for a visit, and mentioned in his diary meeting a “New England magistrate”. John was friends with Rev. John Robinson, pastor of the Pilgrims in Leiden. However, his English origins aren’t entirely clear. See this detailed article Brown of Plymouth and Wannamoisett for more. John married Dorothy BEAUCHAMP in 22 Dec 1611 St James, Clerkenwell, London. Alternatively, they were married Sep 1613 in Kent, England. He knew the refugees in Leyden, when in his younger days he traveling on the Continent, he became acquainted with Rev. John Robinson, pastor of the Pilgrims, and through him met many of his people in the same way that Governor Winslow and Captain Miles Standish came to join the Pilgrims. He sailed from London, 22 Jun 1632, on the Lyon (4), William Pierce – Master, “bound for Watertown with his wife Dorothy, and children Mary, John and James and William”, who were probably named in the order of their birth. The ship arrived in Boston on 16 Sep 1632, twelve weeks from London and eight weeks from Land’s End and John settled in Duxbury. On the same ship was Isaac Robinson, son of Leyden pastor John Robinson and another ancestor of ours, John BENJAMIN. John was prominent in the Plymouth colony. He was living in Duxbury in 1636; in Taunton in 1643 but soon moved to Swansea. He was Assistant for seventeen years; served as one of the Commissioners of the United Colonies for twelve years, and sat on the Council of War for three years. He was one of the lessees of Kennebec trade in 1649. He made a will on 7 April 1662. John died on 10 Apr 1662 in Swansea, Mass. He died less than two weeks after his son John Jr. who had made his father guardian of five children and executor of his estate. Dorothy Beauchamp was born about 1583 in Northamptonshire, England. Dorothy died 27 Jan 1673/74 in Swansea, Bristol, Mass. John Browne was associated with Edmund FREEMAN of Sandwich, and Edmund’s brother-in-law in England, John Beauchamp who was a native of Cosgrove, Northamptonshire, son of Dorothy Clarke of Roade, Northants. John Beauchamp went to London. He was married to Alice Freeman, who might have been a cousin of that Alice (Freeman) (Thom[p]son) Parke who was daughter of Henry and Margaret (Edwards) Freeman.. According to French, Alice(Freeman) Thompson’s daughter Martha married John2 Browne. Martha’s sister Bridget Thompson was said by French to have married George Denison, whose daughter by his second wife was the Margaret Denison who married James3 Brown. 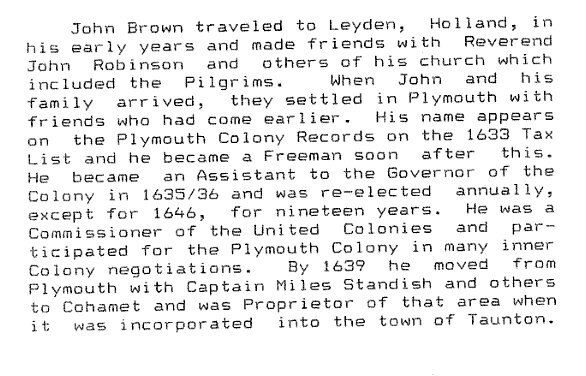 Shortly after his arrival in Plymouth, Mr. John Browne was chosen as an Assistant to the Governor of Plymouth Colony in Jan 1635/36, the same day he was admitted as freeman, and was elected again each year for nineteen years with the exception of 1646. He was treated with deference and respect by John Winthrop, John Winthrop,Jr., Roger Williams, William Coddington, Samuel Gorton, Edward Winslow, Miles Standish, Timothy Hatherly and Edmund FREEMAN. The elected leadership of Plymouth Colony at first consisted of a governor and an assistant governor. The assistant governor for the first three years of the colony’s history was Isaac ALLERTON. In 1624, the structure was changed to a governor and five assistants who were referred to as the “court of assistants,” “magistrates,” or the “governor’s council.” These men advised the governor and had the right to vote on important matters of governance, helping Bradford in guiding the evolution of the colony and its improvised government. Assistants during the early years of the colony included Thomas PRENCE, Stephen HOPKINS, John Alden, and John HOWLAND. In 1637 he and Capt. Miles Standish laid out Cohannet, and by 1639 he had moved there with Standish and others He was a proprietor there when it was incorporated as the town of Taunton. 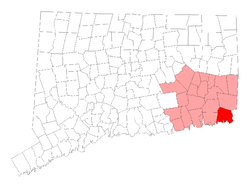 Taunton once included many surrounding towns, including Norton, Easton, Mansfield, Dighton, Raynham, and Berkley. In 1641 he and Standish laid out Barnstable and Yarmouth. Later he was a partner with John Winthrop, Jr., in Stonington, Connecticut. Thomas MINER, Walter PALMER, William Chesebroughand Thomas Stanton were the founders of Stonington in 1648. 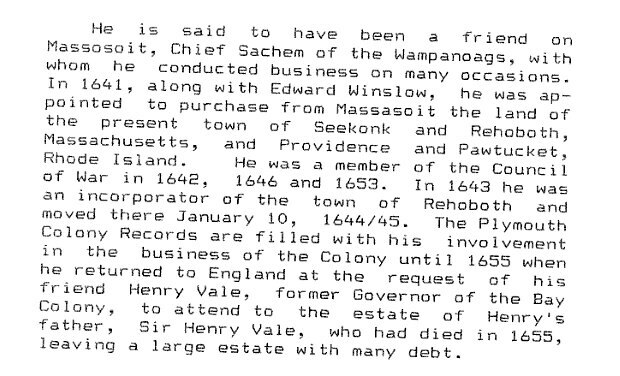 In 1641 he and Edward Winslow purchased Rehoboth (including the present towns of Seekonk, East Providence and Pawtucket), extending Plymouth Colony into the Wampanoag lands by purchase rather than expropriation. He became a friend of Massasoit, the chief of the Wampanoag Indians, and as a result the life of his son James was spared during King Philip’s War in the 1670s by Massasoit’s heir. He wrote to Governor Winthrop of Massachusetts Bay as “Loving Friend,”and was on good terms also with leading men in Rhode Island. By 1644 he lived in Rehoboth, where he was a neighbor of Roger Williams at the time the latter got his charter in 1644 with the help of the Earl of Northumberland. As well as serving with the colonial leaders as an Assistant, he was a member of the Council of War in 1642, 1646 and 1653, and Commissioner of the United Colonies of New England from 1644 to 1656, serving longer than any other. Thus he was useful to Plymouth Colony in negotiations with the others. In 1643 he was an incorporator of the town of Rehoboth, and he served there as Townsman in 1645-1646 and 1650-1651. He was one of the wealthier men in town, was a landed proprietor in Maine, Rhode Island and Connecticut, and had extensive interests in the New Netherlands as well. In 1644 John Winthrop, Jr., was conducting business in England for him. In 1645 he helped preserve Plymouth Colony’s jurisdiction in his area from an encroachment attempted by the Massachusetts Bay Colony with the support of one Richard Wright of the town. On 29 Oct. 1645 the town meeting voted that he should undertake to buy Wannamoisett (now East Providence and Barrington, R.I.) from the Indians for £15 worth of commodities with the provision that the Indians would move from the land and John Browne would retain title to it. He settled there permanently. He represented Plymouth Colony’s opposition to placing Roger Williams’ charter in effect in Rhode Island while on a trip to Providence, and then went to Shawomet to support the followers of Samuel Gorton against interference from twenty Massachusetts Bay families. In 1651 he and Timothy Hatherly boldly resisted the claim of Massachusetts Bay to Samuel Gorton‘s area going before the Commissioners of the United Colonies, saying of Plymouth, “not an inch of her soil could be alienated except by the whole body of freemen in General Court assembled” . Hatherly had visited at Kennebec and Penobscot in 1631 while John Browne and Thomas Willett were there, and become a close associate of Browne at Plymouth. While Hatherly lost his seat as a Assistant because of his opposition to intolerance, Browne did not. He was a liberal concerning religion; in 1645 he supported William Vassall’s petition and a motion to grant “full and free tolerance of religion to all men that will preserve the civil peace and submit unto the government,” with “no limitation or exception against Turk, Jew, Papist, Arian, Socinian, Nicolaitan, Familist, or any other”. The motion failed on a tie vote. His was the first magistrate’s voice to offer the opinion that support of the church should not come from taxes. In 1665 he pledged his own property as a bond that the church could be supported from voluntary contributions. Yet he “persecuted” his son James for becoming a Baptist, and sued the Reverend Mr. Samuel Newman of the Church of Christ as a result of slander, for which he was awarded the handsome sum of £100, which he remitted at once. It is to be noted that the content of the defamation has been suppressed. Samuel Newman (1602 – 1663) was a clergyman in colonial Massachusetts whose Concordance of the Bible, published first in London in 1643, just before Newman’s removal from Weymouth to Rehoboth, far surpassed both of the previous two works of its kind. Newman graduated from Trinity College, Oxford in 1620, took orders in the Church of England. He was prosecuted for nonconformity and emigrated to Massachusetts Bay Colony, probably in 1636. After preaching nearly two years at Dorchester, he became pastor of the church at Weymouth, where he remained until 1643. 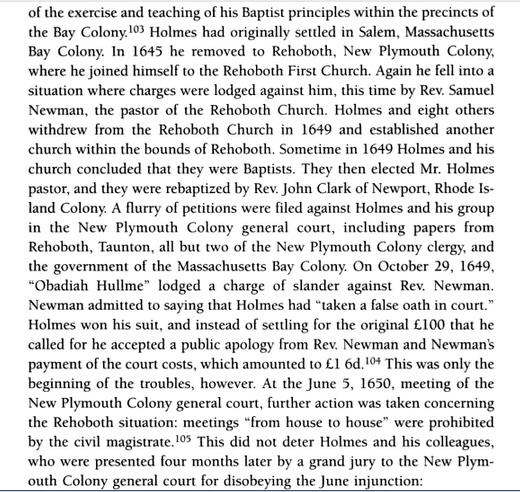 The following year he removed with part of his church to Seconet, in Plymouth Colony. 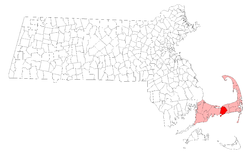 There they founded the town of Rehoboth, which then embraced what is now Seekonk, Massachusetts and Pawtucket, Rhode Island. The second edition was published at Cambridge in 1662 and the concordance was usually known after that as the Cambridge Concordance. The concordance was reprinted at least as late as 1889, almost 250 years after it was first published. Samuel died in Rehoboth on July 5, 1663. Various records mention John’s shipyard, which was probably in Bullock’s Cove, RI, and numerous dealings in land. He was a member of the highest class, and his son-in-law, Mr. Thomas Willett, who had come to New England also on the Lyon in 1631, became in 1664 the first English Mayor of the City of New York. The Clarendon Papers at the Bodleian Library, Oxford University, reveal that the reason he left public service in Plymouth Colony was that he had returned to England in 1655, in the service of the Vane family as executor of the estate of the senior Sir Henry Vane, including Raby Castle in Durham, while Sir Henry Vane (born 1589, died 1655 [one of the chief officers of King James I], who had been in America from 6 Oct 1635 to 3 Aug 1637, and had served as Governor of Massachusetts Bay) was imprisoned by Cromwell, the dictator of England. In 1655 John Browne stayed with the Wray family at Belleau, the Lincolnshire home of Sir Harry Vane (born 1613, died 1662, son of Sir Henry Vane the Elder) not far from Boston, where Roger Williams had also stayed. While Mr. Browne was at Belleau in 1657 George Fox [Founder of the Society of Friends] came for a visit, and mentioned in his diary meeting a “New England magistrate”. Upon the Restoration in 1660, when Charles II returned to the throne, Mr. Browne sailed to his home in Wannamoisett. Sir Harry Vane’s wife Frances was a daughter of Sir Christopher Wray. 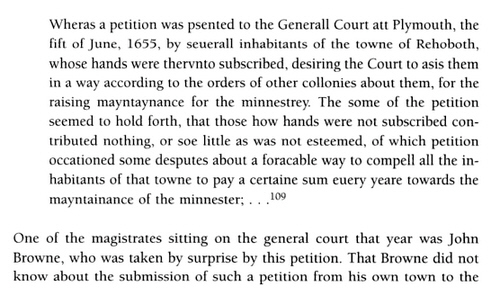 In 1627 Sir John Wray had been in Gatehouse Prison for failure to collect the ship loan of Charles I. John Browne of Sutterton, a village just south of Boston in Lincolnshire, was among those failing to pay the tax. William Coddington, who also resisted the tax, came to America with the Rev. John Cotton of St. Botolph’s church in Boston, was for a time of St. James’ Clerkenwell, and a relative of Edmund FREEMAN of Sandwich. When John died of fever he was buried in Little Neck Cemetery at the head of Bullock’s Cove in Wannamoisett. 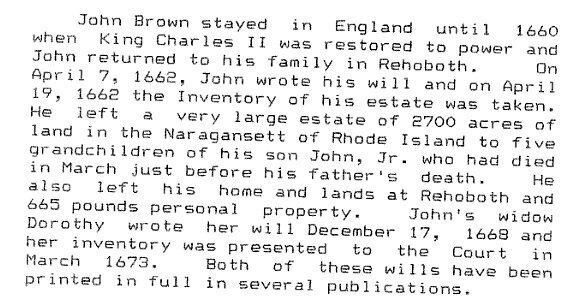 In his will he left 1,700 acres of Narragansett lands to the children of his son John, who had died ten days before he did, and he was able to leave a large estate valued in the inventory of 19 April 1662 at £665.1s.2d, but including only £6 in cash! He left his daughter Mary Willett only 12d “to bee payed att the end of every yeare During her life for a memoriall unto her; and it shalbee in full of all filiall portion which shee or any in her behalfe shall Claime”. 28 Dec 1611 – John Browne licensed to marry at St. James Clerkenwell, London, Dorothy Beauchamp. His wife Dorothy died in Swansea 27 Jan 1673/74, aged 90 years [Shurtleff’s Plymouth Records, 8:48]. Two children of John and Dorothy (Beauchamp) Browne were baptized at St. James’, Clerkenwell, London namely Edward on 19 July 1620, and Rebecca on 30 May 1622. John’s son William was possibly his nephew or brother. He was a passenger on the Lyon, in 1632, lived Duxbury in 1643, probably returned to England in 1655 lived in Plymouth 1663, in Sandwich in 1667, and was a sea captain. 1633 – Chosen as an assistant to Governor Bradford and held that office seventeen years. He was also chosen assistant for the years 1636 and 1649. 4 Jun 1652 – In the governor’s court he won a notable suit for damages for defamation against Samuel Newman, the judgment being for one hundred pounds and costs. Mr. Browne waived the judgment, however, and let Newman off on payment of the costs. c. 1660 – He laid the foundation for the establishment of Swansea, but it was his son-in-law Capt. Thomas Willett, Plymouth Colony Magistrate and the first English mayor of the city of New York, who was the actual founder and who completed the work after the death of John Brown. It was the fight between the Baptists and the Congregationalists in the Church of Christ at Rehoboth that finally resulted in the founding of the Baptist township of Swansea under the spiritual leadership of Mr. John Myles. The town of Swansea was founded on the basis of a class division of inhabitants that existed nowhere else in New England. On 5 Mar. 1667/8 the Plymouth Colony Court appointed “Capt Thomas Willett, Mr. Stephen Paine, Sr, Mr. John Browne, John Allen and John Butterworth” (all Rehoboth men) to have charge of the admittance of inhabitants; to dispose of the lands; and to have the control of the affairs of the new township “att Wannamoisett and places adjacent” later to be named Swansea. While he was travelling in his youth he became acquainted with Rev. John Robinson, pastor of the Pilgrims, and through him met many of his people in the same way that Governor Winslow and Captain Miles Standish came to join the Pilgrims. He did not come in the “Mayflower,” however. It was not until March, 1629, that he reached New England. He landed at Salem. 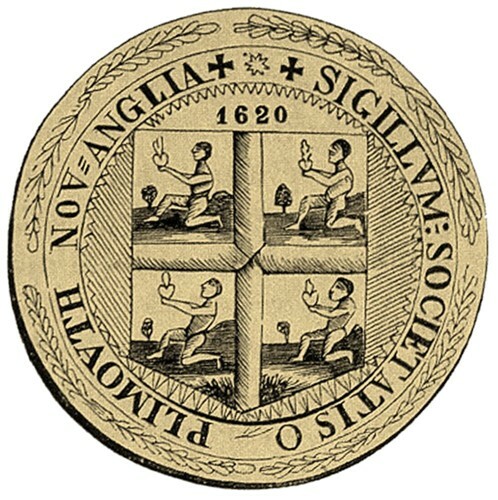 Two years earlier, however, March 19, 1627, the council for New England approved a patent for trade soil and planting on which a Royal charter was obtained March 4, 1628, to certain patentees and their associates, among whom were John Browne, John Saltonstall, and others who became well known in the colonies. He was elected to Governor John Endicott’s council, April 3, 1629, with Francis Higginson, Samuel Skelton, Francis Bright, Samuel Browne, Thomas Graves and Samuel Sharp. He went from Salem to Plymouth and later to Taunton with his son, James. In 1643 John Brown and his sons, John and James, were residents of Taunton, but next year they settled at Rehoboth,Massachusetts. 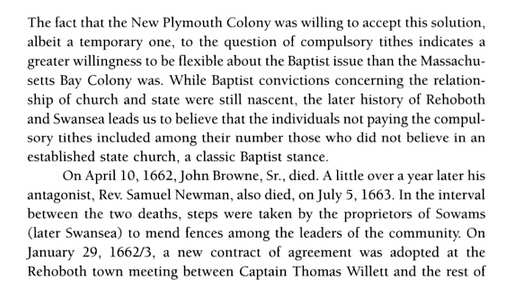 There John Browne, Sr., and John Brown, Jr., stayed and were among the first settlers, but James Browne being a Baptist was forced to leave town in 1663 and with others of his sect founded the town of Swansey, Massachusetts. The designation Mr. given him in the records always shows that he was counted among the gentry. His sons and grandsons were leaders in civic, judicial and military affairs. 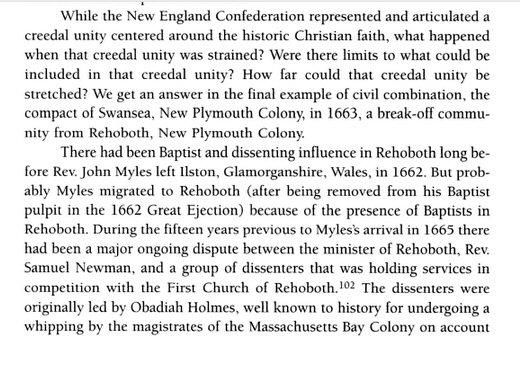 John Brown was appointed one of the townsmen (an office) in Rehoboth, March 16, 1645, and again in 1650-51. He served the town on important commissions. He was on the prudential committee. He was for seventeen years from 1636 to 1653 0ne of the governor’s assistants or magistrates. In 1638 the following were the governor’s assistants: William Bradford, Edward Winslow, Captain Miles Standish, John Alden, John Jenny and John Browne. He was one of the commissioners of the United Colonies of New England (which foreshadowed the later confederation) from 1644 to 1655. 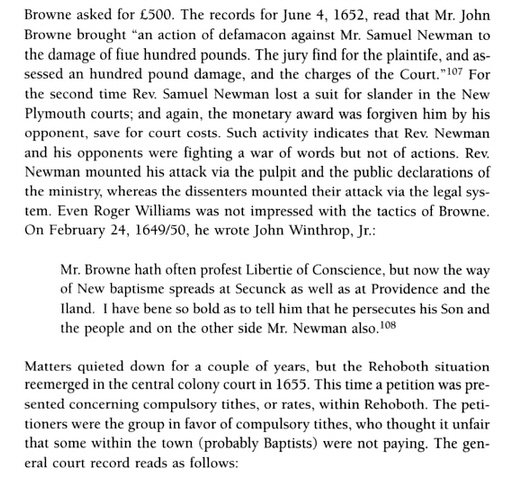 In the governor’s court June 4, 1652, he won a notable suit for damages for defamation against Samuel Newman, the judgment being for one hundred pounds and costs. Mr. Browne waived the judgment, however, and let Newman off on payment of the costs. 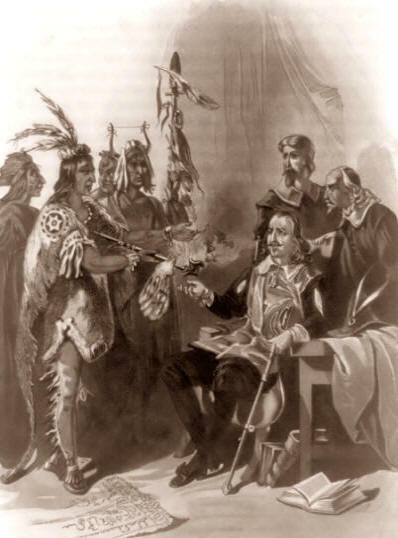 Mr. Browne was a friend of Massasoit, and the proof of their friendship was shown when the life of his son James was spared by King Philip, son of Massasoit, when he came on a mission from the governor to the Indians. Colonel Church in his narrative says: “that the Indians would have killed Mr. Browne, who with Mr. Samuel Gorton and two other men bore the letter, but Philip prevented them, saying that his father had charged him to show kindness to Mr. Browne.” It is said in his honor that he was the first magistrate to raise his voice against the coercive support of the ministry, taking the stand that all church support should be voluntary and backed his precepts by liberal example. He was a man of abilities, intellect, piety and patriotism, and was buried with civic and military honors in 1662. His wife Dorothy died in 1674. His eldest son died the same year as he (1662). His other son, James, was afterwards in the magistracy. His grandson, John Browne, became useful and eminent. 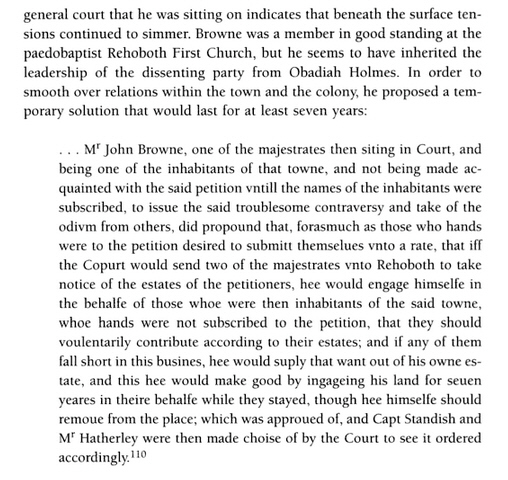 In 1685 John Browne was one of the first associate justices of the court of common pleas in the county of Bristol. In 1688, during the administration of Lord Bellamont, he was again appointed a justice. Major James, of Swansey, born in England 1623, died 1710; Mary, born in England, married, July 6, 1636, Captain Thomas Willett, of Plymouth, the first English mayor of New York city, who was twice elected to that office. William, resided in Salem, not mentioned in will and not proved to be son of John Browne (I). John Browne was successively a Puritan, Catholic, and Jesuit, and then associated with Separatists, Baptists and Quakers, and was perhaps close enough to the Lord Chancellor and the Lord Chief Justice of Queen Elizabeth, as well as to the 1st Earl of Warwick and the Dowager Countess, and perhaps Viscount Wimbledon (the father of Albinia Cecil and grandfather of Frances [Wray] Vane), to finance his own settlement in America. 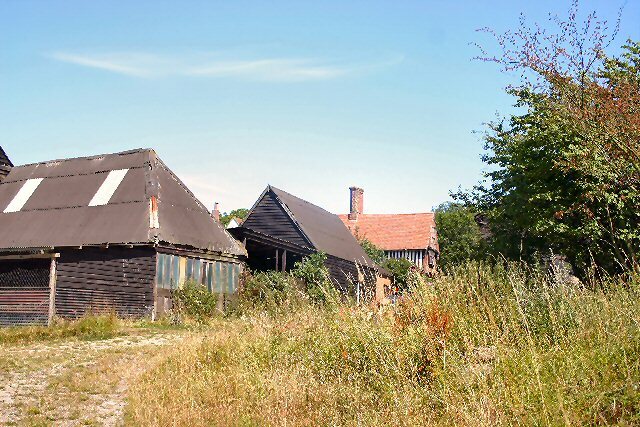 His mother and wife may have been from those prominent families in the area of Lincolnshire, Nottinghamshire or Northamptonshire who were involved in the settlement of New England. While fun, my analysis shows this relates to a different John Browne. Mary’s husband Capt. Thomas Willett was born 29 Aug 1605 in Barley, Hertfordshire, England. His parents were Andrew Willett and Jacobina Goad. After Mary’s death, he married the widow of a clergyman named John Pruden. Thomas died 4 Aug 1674 in Swansea, Mass. Thomas, formerly of Leyden, succeeded Miles Standish as military captain at Plymouth and was the first English mayor of New York. In 1633, after he had become a successful trader with the Native Americans, he was admitted to the freedom of the colony, and married a daughter of Major John Brown, a leading citizen. He shortly afterwards became a large shipowner, trading with New Amsterdam. He was elected one of the assistant governors of the Plymouth colony, and acted as arbitrator in disputes between the English and Dutch colonies; he also became captain of a military company. Early in 1660 he left Plymouth and became the founder of the town of Swansea Mass. Accompanying the English commander Richard Nicolls, he contributed to the peaceable surrender of New Amsterdam to the English on 7 September 1664; and when the colony received the name of New York, Willett was appointed the first mayor (12 June 1665) and a commissioner of admiralty on August 23, with the approval of English and Dutch alike. The next year he was elected alderman, and became mayor a second time in 1667. Shortly after he withdrew to Swansey. He was a member of the New York governor’s executive council from 1665 to 1672. He retired in 1673, and died in 1674, at the age of sixty-nine. James’ wife Lydia Howland was born Feb 1634/35 in Plymouth. Her parents were John HOWLAND and Elizabeth TILLEY . Lydia died 11 Jan 1709/10 in Swansea, Bristol, Mass. James was in England in 1659 when James Cudworth wrote to him there. Possibly he went to visit his father, although the circumstances are not known. In 1665 he succeeded his brother-in-law, Thomas Willett, who was then Mayor of New York City, as Assistant in Plymouth Colony, which post he held also in 1666 and 1673-1683. He was chosen Deputy from Rehoboth in 1666, and from Swansea in 1669, 1671 and 1683. James was a founder of Swansea, Bristol, Mass. James Browne being a Baptist was forced to leave Rehoboth in 1663 and with others of his sect founded the town of Swansea, Massachusetts. For some time he was in the center of the controversy over control of the church in Rehoboth, which raged between Congregationists and Baptists. On 2 July 1667 he and John Myles, the Baptist minister, were each fined £5 for setting up a public meeting without permission of the General Court, while a Mr. [Nicholas] Tanner was fined 20/-. On 30 Oct 1667 the Baptists were given permission to organize the town of Swansea, with a Baptist church under Mr. Myles, the church being the first of that denomination in Massachusetts. 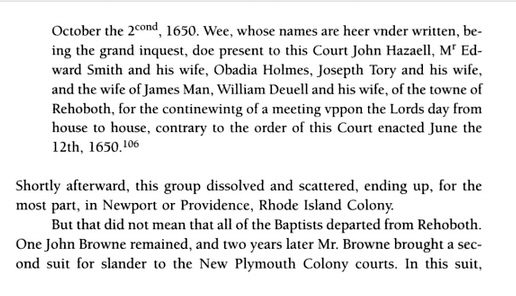 Thus while James Browne served, with John Allen and Stephen Payne, Sr., as a Selectman for Rehoboth in 1666-1667, he was next to serve Swansea as grand enquest in 1668. The records of the two towns were mixed for years afterwards. On June 20, 1675, the first Indian attack of King Philip’s War had all 70 settlers confined to their stockade. By June 25 the entire town had been burned, although a handful of the colonists escaped to Taunton. When the active war ended in 1676, the town was soon rebuilt. It has been said that on 19 May 1668 James used an armorial seal on a deed, “A lion rampant debruised by a bend, chequy, in sinister chief point a crescent,” similar to the arms of the Browns of Cheshire, England. His will, dated 25 Oct. 1694, was proved 11 Jan. 1711. Dorothy’s will, dated 17 Dec. 1668 and proved 29 March 1674, mentions daughter Mary Willett and her children, Sarah Elliott, daughter of Sarah Elliott deceased, son James Brown, grandson John Browne and his brothers Nathaniel and Joseph, granddaughter Dorothy Browne, daughter-in-law Dorothy Browne, daughter-in-law Lydia BROWNE, and granddaughters Lydia and Anna Browne. This entry was posted in 13th Generation, 90+, Dissenter, Historical Monument, Historical Site, Immigrant - England, Line - Shaw, Storied and tagged Mayflower, Most Popular Surname, Not Peter Browne's Brother, Swansea Founder, The Lyon 1631. Bookmark the permalink. John Browne from Plymouth has been discounted as being related to Peter Browne. He was brother to Samuel Browne, who immigrated with him. Another Browne, Kellam, signed on to immigrate at the same time as John and Samuel but his relationship, if any, isn’t known and he never left England. He was a country gentleman of great wealth and university trained. Perhaps he was father to the brothers. John was a lawyer, possibly in London and Samuel is said to have been from Roxwell. They were originally ejected from the colony, just after they arrived in 1629 with a commission from the “Company”, by Endicott. He was rebuked by the governing body in England, including Davenport, Eaton and Winthrop. But they returned in 1632 after Winthrop replaced Endicott. If anyone has proof that he was the John at Clerkenwell, I’d really like to know. There was a Hugh Browne who arrived in the 1620s with the Dorchester Company and a William in the Bay Area who was also an assistant. But no mention that they were related to the two Browne brothers. Diane, Thanks for the updates, I’ve taken a hard look and made a lot of changes. John Brown(e)s are indeed confusing. I have four John Browns who are direct ancestors in my family tree. I haven’t found evidence of Samuel Brown or the 1629 colony ejection. What have you found? Hi just trying to firgure out The Brown line some people have it where John Brown was the first one to come over and start the Brown Line on the ship Ship Elizabeth and now i read Chad Browne was the first one to come over on the ship Martain which one was it ? 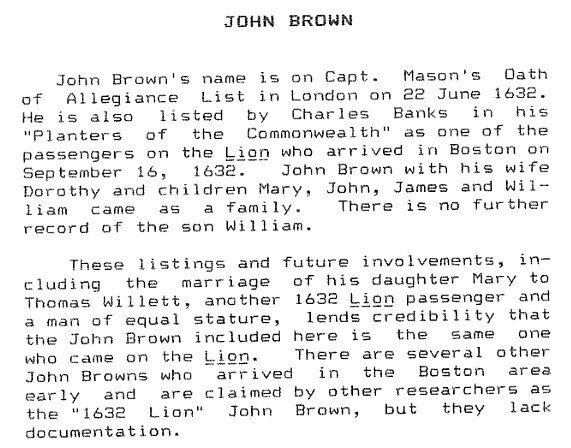 Birth of John Brown (son of Chad(dus) Brown(e)) in Providence in 1627 unlikely since Providence wasn’t established until about 1636-8. Web has some indication that the family came to Boston on the ship “Martin”, landing about July 1638. Family was of major importance in history of Providence, including establishment of Baptist church in America and founding of Brown University. 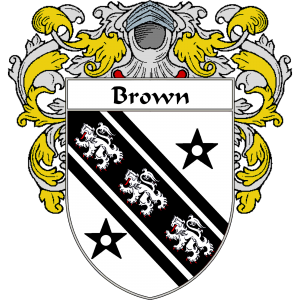 Thanks for the catch, I wasn’t as careful covering these other John Browns (John Brown is the most popular name in my family tree with three direct ancestors of that name. Records can be confusing when they lived in the same town). This John Browne was born in Buckinghamshire. I added a link from the Rhode Island Historical Society on their family tree. It’s an interesting family. There has been some controversy as to whether Chad or Roger Williams was the first pastor of the church, however Reverend Brown was most certainly the first ordained minister of the church. John’s grandsons Captain James Brown and his Obadiah established the basis of the family fortune. James was the first Brown to enter the slave trade in 1736 with his sloop “Mary” under the command of Captain John Godfrey with his younger brother Obadiah acting as the Supercargo. John’s great grandsons, known as “the four brothers” included Moses Brown who helped bring Rhode Island College (Brown University) to Providence. I am gathering facts to trace my Brown family lineage. 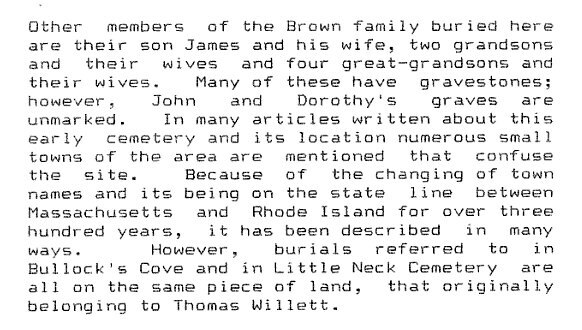 My Brown ancestors have been in Massachusetts for quite some time, and I am wondering if anyone knows the origins of the Browns buried in the cemetary in Heath, MA? Heath, of course, is far west of Massachusetts Bay, in the Berkshires, and I’m trying to determine when these Browns came to Massachusetts. Thank you for any information you may share! Robert Anderson of the Great Migration does a great job of sorting out all the John Browns. If he is correct, your John’s are all wrong. According to him the John Brown who was the baker in London England and brought his apprentice and his sister Sarah Walker was the JB in Rehoboth and Swansea. He was Uncle to Sarah Walker. He is the one who traveled in the Low Countries and met the minister of Leydon. The John Brown of Watertown is the JB with the Hawkedon Suffolk connection. Both of these John’s were married to Dorothy’s. I have family records showing John and Dorothy Brown as maternal great grandparents. These records were passed down through my Great Aunt to my Mother. I have read/heard that land purchased from Massasoit was involved in a dispute and the court ruled in his favor. I believe the land was returned. Also, I read that the Browns took in the children of the poor seeing them established as apprentices. It always amazes me that John and Dorothy lived to such an old age in such primitive conditions. This longevity has carried through to my family as many have reached over ninety with surprisingly good health. I want to thank you for making this information so readily available. Was John Brown born in 1583 or 1600? 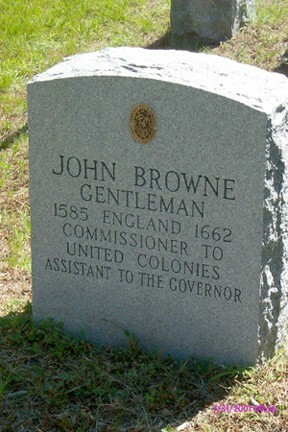 Have you combined several of the John Browns of this time period who were at Plymouth Colony? I am trying to identify the parents of Mercy Heath who witnessed the 30 Dec 1691 receipt of Joseph Brown of Rehoboth for the legacy he received via his uncle James Browne of Swansea from his grandmother Dorothy Brown’s estate. I think Mercy is connected to these Browns. Mercy first married Richard Heath probably about 1682; he died before 1690 and she married second Cornelius Salisbury about 1691. It is likely that both of Mercy’s marriages occurred in Swansea, but the surviving marriage records of Swansea are arranged alphabetically by males’ given names and the pages where Richard and Cornelius would be recorded are missing. She may be the same as Mercy, daughter of William Brown, first of Plymouth then of Eastham who made his will in 1685 and named daughter Mercy. Mercy’s second husband Cornelius Salisbury deeded land bounding John Brown’s land in Providence. The names of proprietors at Sowams prior to 1680 included John Brown, James Brown, James Brown, Jr., Richard Heath, and William Salisbury, brother of Cornelius.